In 1911, my Grandfather a Canewdon man worked as a stockman, lodging at Mount Sail, Burnham on Crouch. So in all probability, he used the horse ferry to take stock to the other side. Above is a picture of the Creeksea Horse Boat c1900, with tethering rings to hold the animals in place on the inside of the boat. 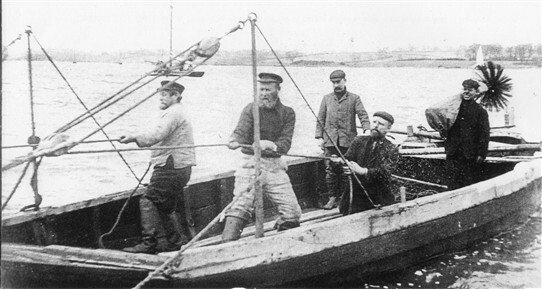 The crewmen are working on the ropes, that raise or lower the ramp. The jolly looking sweep looks like he’s having a busy day, I'm not sure if the other chap is watching with apprehension or fascination. Creeksea Ferry linked the Townships and villages of the Eastern Dengie Hundred - Burnham, Southminster, Tillingham and Bradwell - with the Rochford Hundred Communities of Rochford, Paglesham, Canewdon and, later Southend. Despite its name, it would appear that the ferry was controlled from the Canewdon side of the river landing on the western tip of Wallasea Island where a causewayed road crossed the stream linking Lion Creek with Paglesham Creek. It also gave access to the summer grazing lands of Wallasea Island, and later provided ready access to London for the communities north of the Crouch. There seems also to have been a considerable traffic of horses bred on the Foulness marsh farms for use on farms in the Dengie Hundred, and for the Southminster horse sales, where many were sold for use in London. Taken from: F.L. Wallace, letter 'The old-time ferry', Essex Countryside, Dec 1959 and Crossing the Crouch, Burnham Museum Publication 2.